If you didn't see the humor in the Republican National Convention last week, perhaps the Democrats will lighten the mood. Watch Kal Penn host the DNC live from Charlotte on Thursday, Sept. 6th at 8pm EST at BarackObama.com. No word on whether there will be unicorns or Neil Patrick Harris but we can hope. There is always hope. There is continuous live streaming of the DNC on BarackObama.com so make sure to check it out. Don't forget to watch former President Bill Clinton speak tonight. I hear he's pretty funny, too. I am a proud member of Momocrats.com. No compensation was provided, I just think everyone should garner all the info and make their own choice come November. 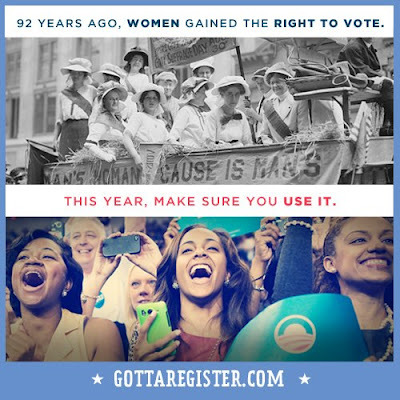 Don't forget to register and get out and vote! Your voice counts. All opinions are, as usual, entirely my own. Thanks for sharing! I was so proud to be on the side I'm on last night. Still looking for that ball Michelle hit out of the park! Loved Michelle's speech. She's such a great speaker!